The University of Oklohoma will present an evaluation of the UniDose system at the coming APhA, March 22-25th | RescueDose Ltd. 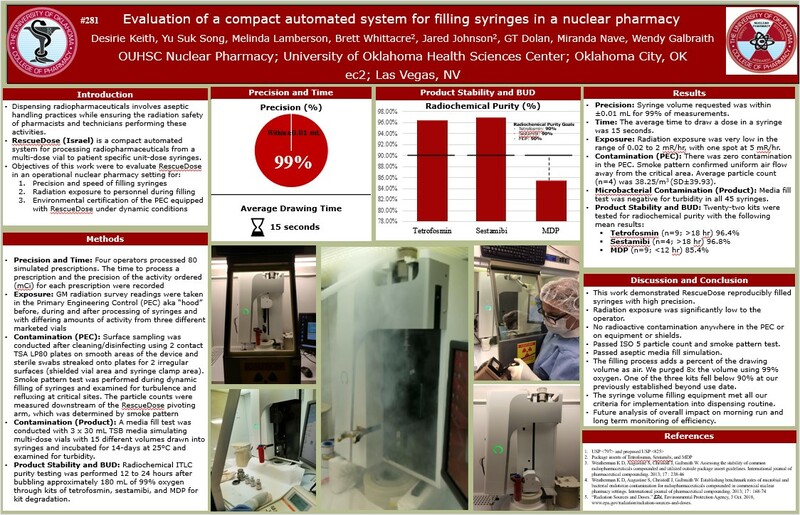 Researchers from the OUHSC Nuclear Pharmacy at the University of Oklahoma will present a poster on “Evaluation of a compact automated system for filling syringes in a nuclear pharmacy” at the coming APhA in Seattle, Washington (March 22-25th). The authors’ conclusions are that the RescueDose reproducibly filled syringes with high precision and significantly low radiation exposure to the operator. Furthermore, there was no radioactive contamination in the PEC or on equipment or shields.